Don't count out the dome tent! 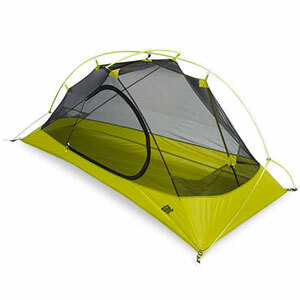 The Shifter 2 is a great all-rounder backpacking tent for what most of us do in the mountains, with affordable quality. The Mountain Hardwear (MH) Shifter 2 is a three-season tent designed to allow different configurations depending on how you arrange the fly. 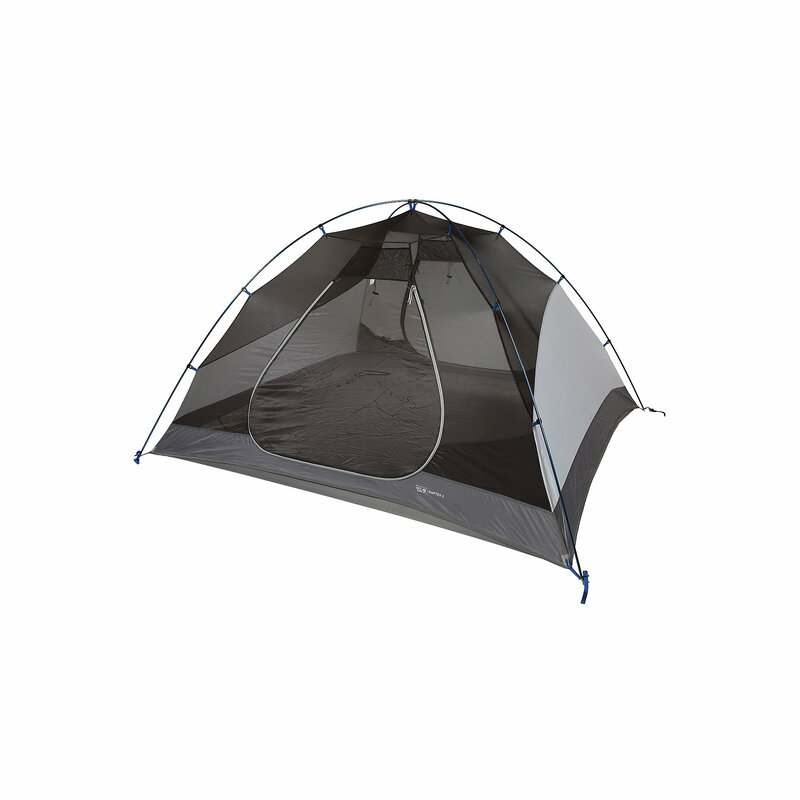 Theoretically you could face the more solid side of the tent into the prevailing wind in a storm and gain a little added protection. 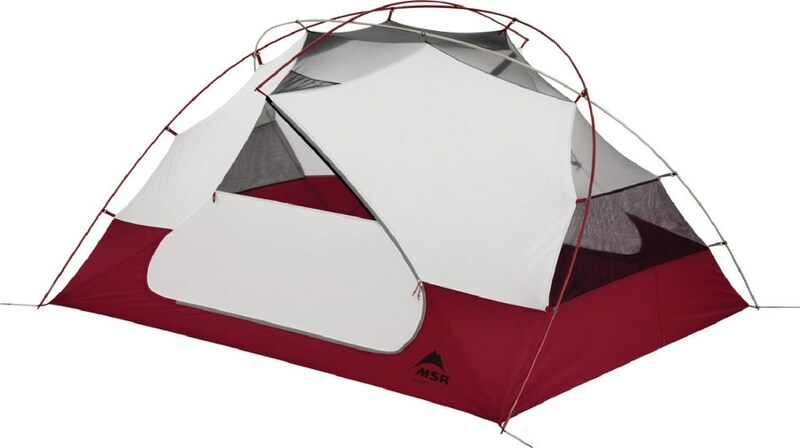 Tents in this category and price range, in my opinion, make up the bulk of backpacking tents on the trail today. Of course I set it up in the yard first to make sure everything worked and that I had the required skill to set it up properly. It is also much easier to photograph in perfect weather in the middle of the day. I tested the Shifter in the timber on the flanks of Mount Saint Helens in March, which is sort of considered winter/spring conditions. It rained all night, temps were in the mid-thirties and humidity was super high (foggy). I set it up in near darkness and I got so cold that my fingers went numb before I was done. The other test days were in Leavenworth with perfect summer weather and no wind (I was kind of disappointed) so I really didn’t get to torture the Shifter that trip, but it carried nicely. Later this summer I will be hiking over longer trails and camping on the snow more, so hopefully I’ll get to add to this review. At 5 pounds 12 ounces the Shifter 2 isn’t ultra-light, but I also see a lot of smiling hikers lugging seven pound tents into the back country without batting an eye. 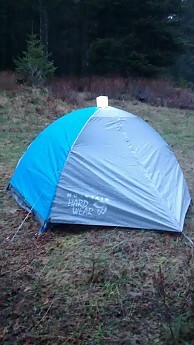 To me, for the shelter this tent provides from the weather, the weight is about right. To make the tent lighter, use a homemade tyvek footprint or none at all. Divided among two hikers and it becomes almost ultralight; under three pounds. One side of the fly is larger than the other giving you a nice big vestibule. 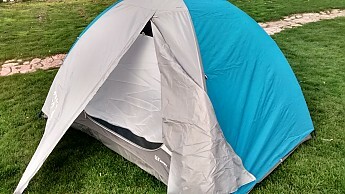 One side of the tent has a mesh door and the other is solid so, if you rotate the fly around you can open the fly and see out and the other way you can leave the fly open and still have privacy. 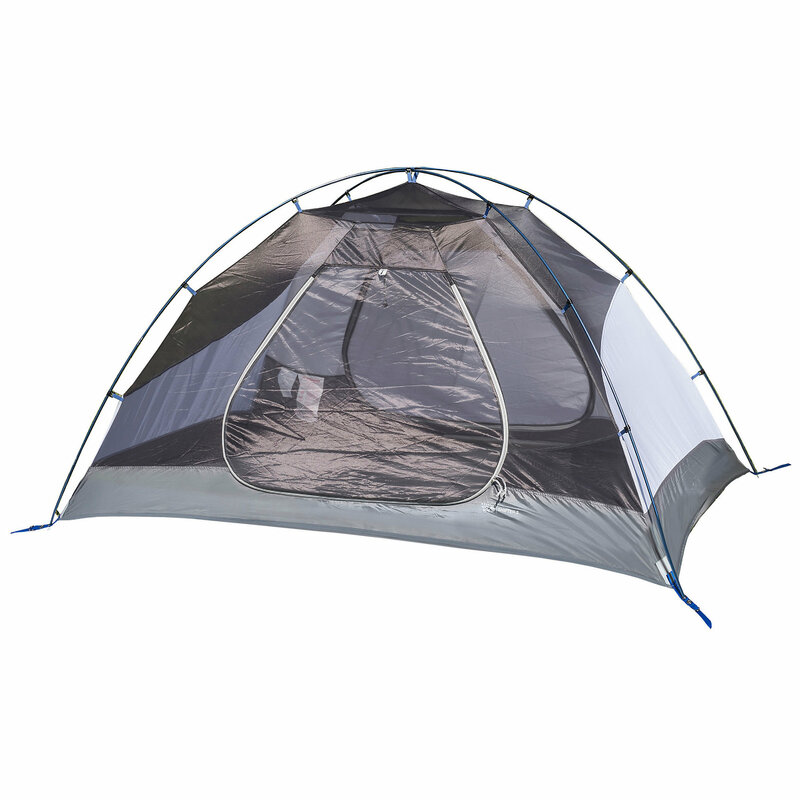 The included footprint is tough, attaches to the corners of the tent and will save your floor. I recommend using it all the time. I like the teardrop shaped door with rounded corners because you only unzip one zipper to come and go. The toggles to tie back the fly doors also open beer bottles, you can never have too many of these. My older model MH South Col pack uses these to secure my ice axe. If you want to save a sliver of weight replace or remove them. I’ve had tents dissolve around me from nylon-shredding winds, so I have a good idea as to where tents are likely to fail. The Shifter is reinforced at stress points in many similar ways to my four-season tent (MH Direkt 2) and these reinforced places, in my experience are sources of failure on lesser tents. 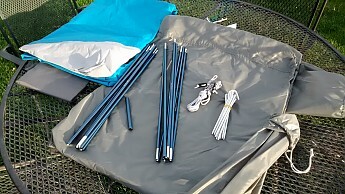 The fly, bathtub floor, zippers, guy lines, and poles are definitely higher end for 3-season tents. If you have set up a two-pole dome tent in the past twenty or so years you can set up the Shifter. The only interesting part of erecting the Shifter was the unique large vestibule side of the fly (it is partially blue in the pic) which stands straight up. It took me about three extra seconds to stake out the fly compared to a more basic design. I set this tent up in the semi-dark at Saint Helens and, because it is so straightforward I could probably do it with my eyes closed as well. 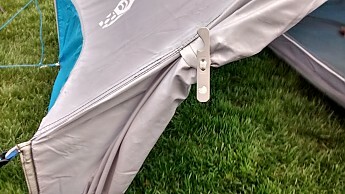 The footprint attaches nicely to the corners of the tent. 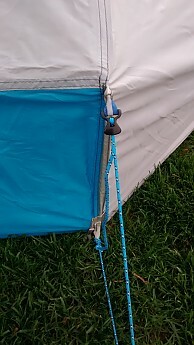 Tensioners were a robust design and add to the usability of the tent. Thick aluminum wire, nothing wrong with them or special either. If you prefer, buy better/lighter ones. I’d use the X-shaped ones from my 4-season tent. The aluminum poles the Shifter uses are high quality, stiff, and easy to put together. 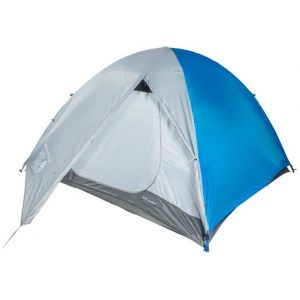 They fit together tightly and provide a strong backbone to the tent. They are among the best I have used. I know some people prefer other, more intricate pole configurations but I am still a believer in the basic two-pole dome which even your brother in law could figure out. The Shifter also came with a short repair piece that I doubt I’ll ever need, but I’ll never leave behind either. To divide the tent among two people, one can carry the stakes, footprint, and poles and the other can carry the fly and tent. 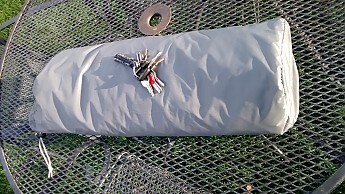 I’m a tent stuffer (some prefer rolling) and I found the Shifter to agree with my method, fitting nicely back into its bag. 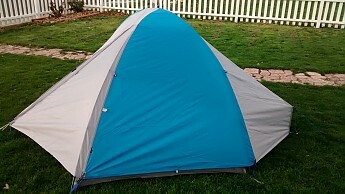 This tent fits inside my 70 liter pack for overnight trips. 25”x7” is the packed size. The rainy night before our Saint Helens climb/ski trip my girlfriend and I engaged in some condensation-producing activities in the tent (anything for science) to test the breathability of the Shifter. We never once had a drip of condensation on us during the soggy windless night. As I said, it rained all night on Saint Helens (I hate rain-camping) and we slept dry and drip-free. My girlfriend's idea of camping used to be staying in a Howard Johnson, so drips would not have scored me any points. The seam sealing and DWR finish on the fly does its job. I’d easily take this tent on a multi-day hike in sketchy weather. 83”x 54” inside. 35 square feet inside. Nine square feet vestibule area. My head and feet cleared the sloped walls with two inches on either end. My girlfriend and I (I’m 5’ 10”, 185#) had more than ample room to move around, sit up, get dressed, and even sleep without touching the sides of the fabric. We slept with our packs inside the tent because the ground outside was drenched and there was ample room. We left the boots in the vestibules where they belong. 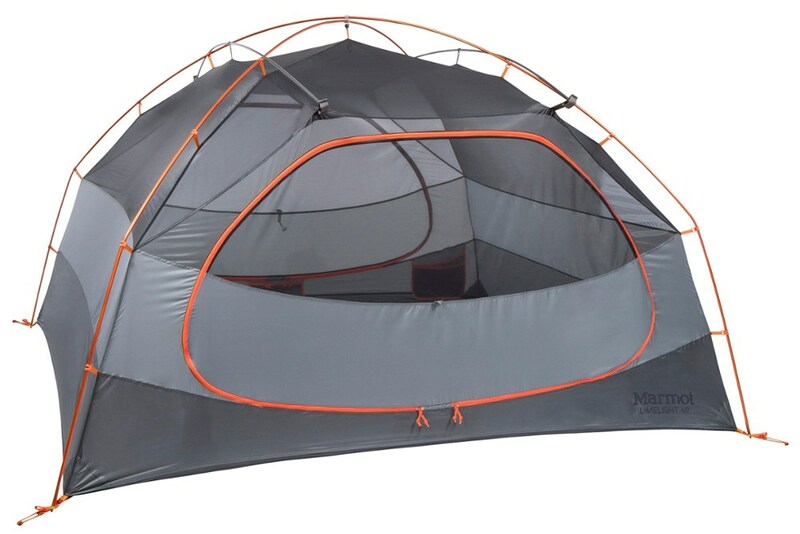 I could see myself putting another small adult or a child in this two person tent but it would be cozy. I know it's officially verboten to speak of this, but I’d easily cook in the ample shouldered vestibule if I had brought hot food. The large “shouldered” vestibule feels roomier because of the small blue vertical panel that gives it a taller ceiling. 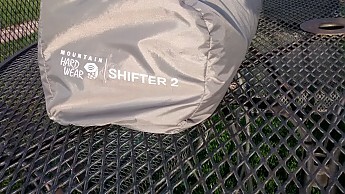 The Shifter has pockets and a gear loft like all other tents in this category. No lack of places to put wet socks, lights, etc. 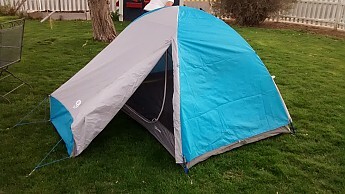 My girlfriend complained that the netting side of the tent where she slept was cold, compared to the solid door side. So guess which side I got moved to? Yes, it is colder. The difference between netting and another layer of solid nylon is noticeable. Call it a feature if you want; the warmer sleeper gets the mesh side! With such great poles I expected better stakes. They are a step up from a Walmart stakes and are totally fine for most applications (just not sand or snow). Guying out the fly leaves a little looseness that could still flap in a storm, if you are used to a drum-tight 4-season tent this isn't it. Not a deal breaker though. 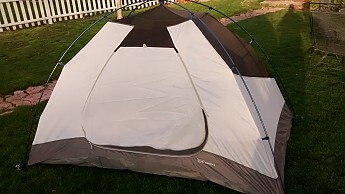 I think this tent definitely fills the role of backpacking tent for 90% of the hiking that people do; on trails in the spring/fall/summer when it could rain or snow but probably won’t. Even if it does shower the Shifter will keep you dry. I am not excited about the whole configuration for privacy idea because I’m not a car-camper and I avoid crowds, but it’s a free bonus that doesn’t detract from the tent’s functionality. 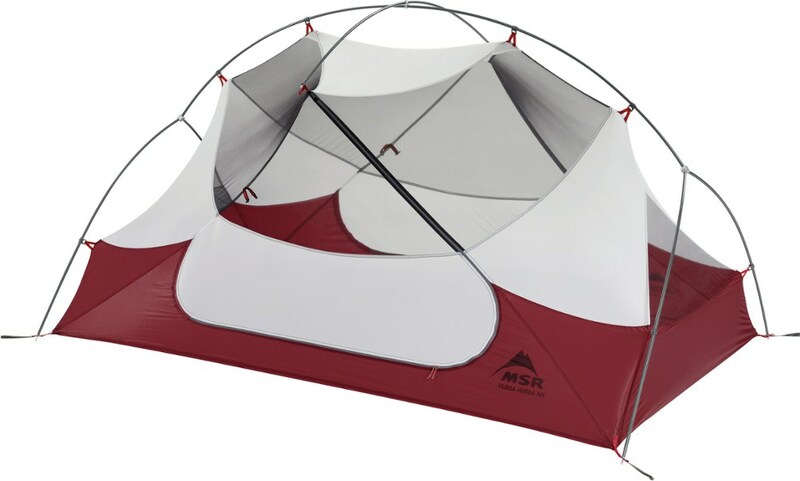 This simple tent is pretty vanilla on features and could easily be a trail tent that keeps you dry at night for years without adding too much weight to your pack or breaking the bank. Solid review, Jeff! 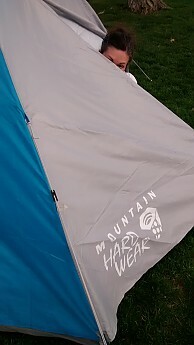 MH has been putting out some pretty quality tents lately. I am a big fan of the Optic. One more thing I need to try is to set it up with just the footprint and rain fly only for fast and light travel. Solid review Jeff! Thanks for sharing it.